This Everyday Mediterranean Salad recipe is quick and easy to make, tossed with a simple Greek vinaigrette, and can easily double as a side salad or main dish. 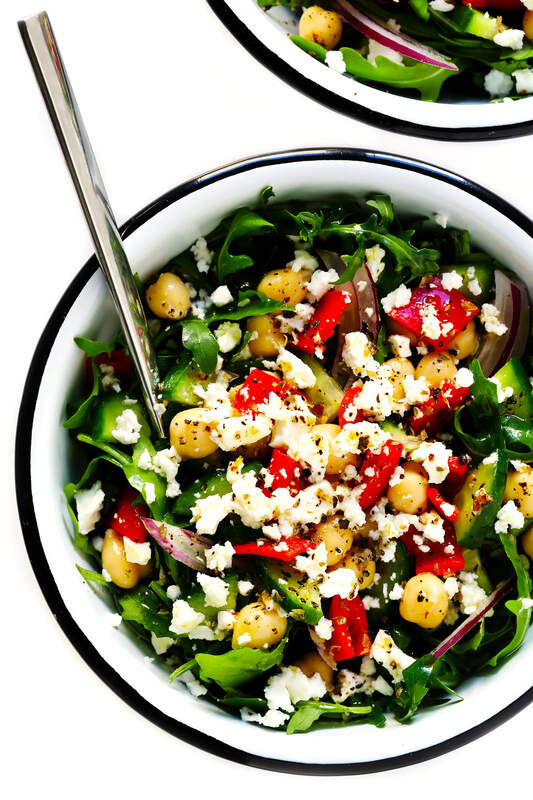 This salad is perfectly balanced with so many of the Mediterranean flavors I love most — peppery arugula, hearty chickpeas, cool cucumbers, smoky roasted reds, tangy feta cheese and a super-simple herby Greek vinaigrette that brings it all together. It is easy to throw together in just 10 or 15 minutes. It holds up well in the fridge if you would like to make it a few hours in advance (see tips below) or bring it along to a party or potluck. It’s also easy to gussy up with any extra proteins, veggies, olives or nuts that you might want to toss in, or (bonus!) it be easily be transformed into a delicious pasta salad if you would like to add in some cooked orzo or pretty farfalle. But best of all, it’s just super fresh and flavorful and a total fave of mine. Feel free to make a meal out of it, or serve it as a side salad, or whatever sounds good. I think you’re going to love it! 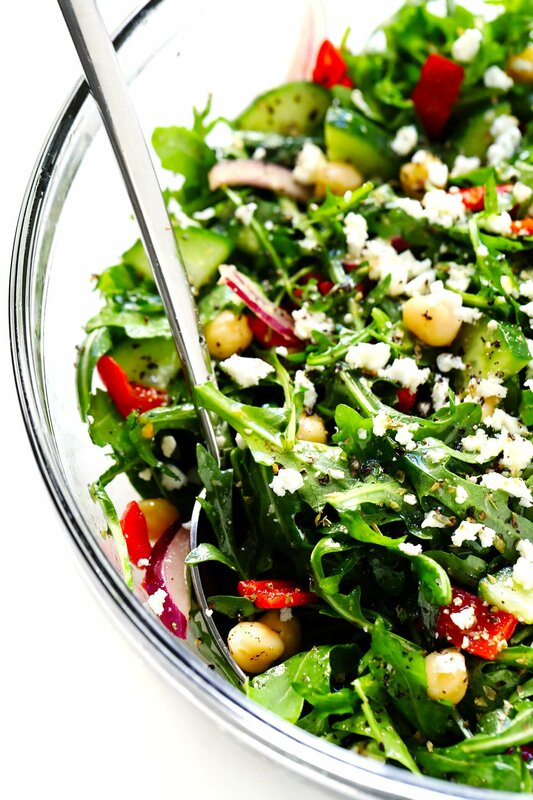 Greens: I love using hearty arugula for this salad, but any of your favorite salad greens will work well too. Fresh Veggies: I just thinly sliced some red onion and English cucumber, but feel free to add in any extra veggies that you are craving or have on hand. Roasted Red Peppers: I diced about half a jar of store-bought roasted reds, but feel free to roast your own peppers or use fresh bell peppers instead. 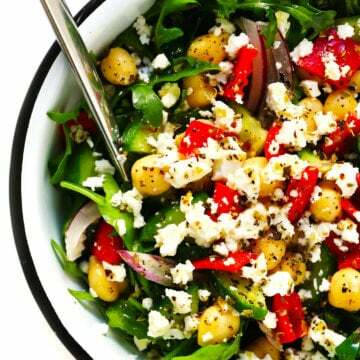 Chickpeas: One can, rinsed and drained, to add some extra heartiness to this salad. 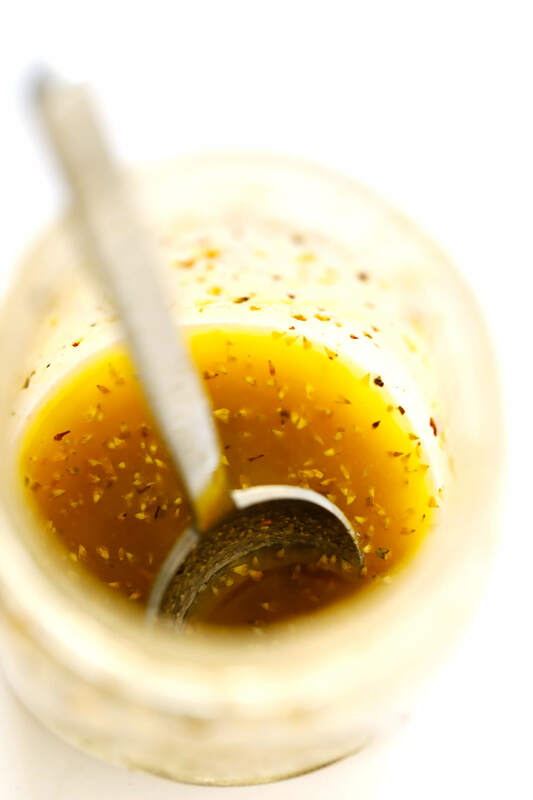 Greek Vinaigrette: Made easily with pantry staples, including olive oil, red wine vinegar, Dijon, garlic (or garlic powder), dried oregano, salt and pepper. Serve. Enjoy right away while it’s nice and fresh! 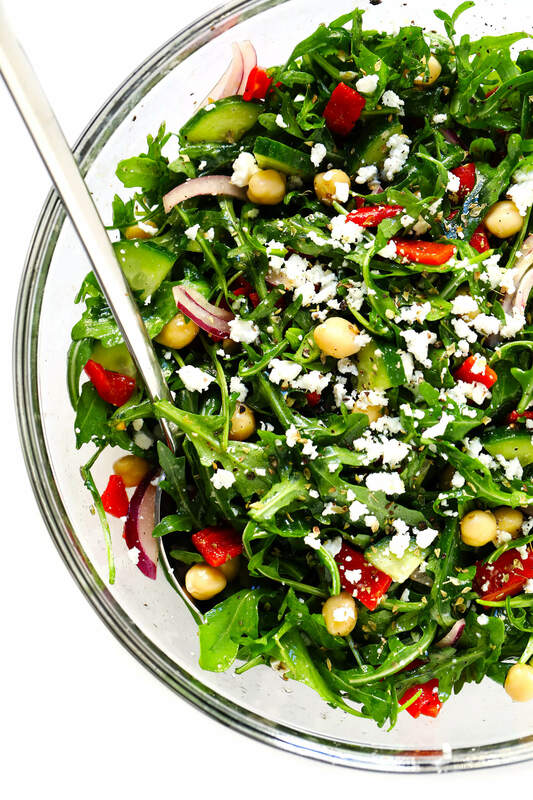 If you would like to prep this salad a few hours in advance, just combine everything except the arugula in a large mixing bowl, place the arugula lightly on top, cover and refrigerate until ready to serve. Then give the salad a good toss right before serving and enjoy! Add a protein: Cooked chicken, steak, pork, shrimp, salmon, or tofu would all be great added to this salad. Add extra fresh veggies: Such as fresh bell pepper, tomatoes or radishes. Add extra jarred veggies: Such as artichoke hearts or sun-dried tomatoes. Add olives: Kalamatas or any other Mediterranean olives you love would be delicious! Add nuts: Pine nuts, pepitas, almonds or whatever might sounds good. Add fresh herbs: If you happen to have any fresh basil or oregano on hand, chop them up to add to the vinaigrette for extra fresh flavor. Use different beans: If chickpeas aren’t your jam, feel free to add in white beans instead. Or nix the beans altogether. 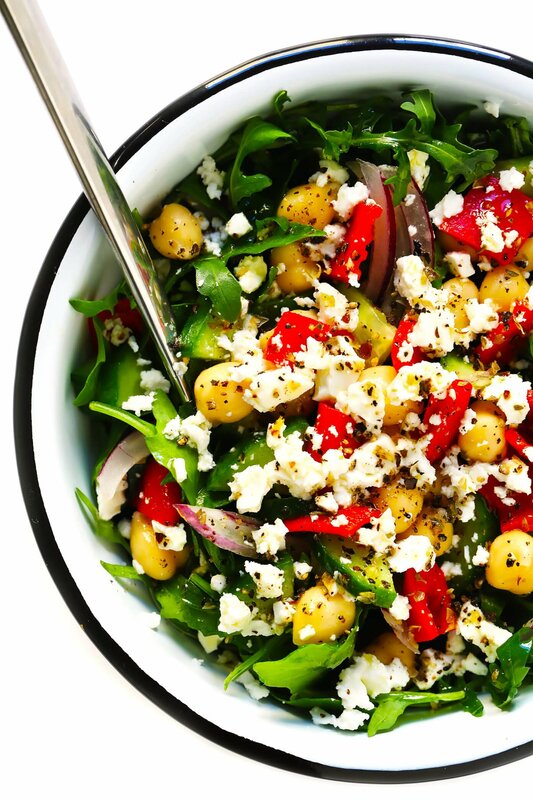 Use different cheese: If you don’t love feta, crumbled goat or blue cheese would also be delicious in this salad. Or feel free to go the Parmesan, Pecorino, or mozzarella route instead! Make it vegan: Just omit the cheese altogether, or use a vegan cheese. This Everyday Mediterranean Salad recipe is quick and easy to make, tossed with a simple Greek vinaigrette, and it can easily double as a side salad or main dish. See notes above for possible ingredient variations. To Make The Salad: Combine all ingredients in a large salad bowl, drizzle evenly with the vinaigrette, and toss until evenly combined. Serve immediately, topped with extra feta cheese and black pepper if desired.